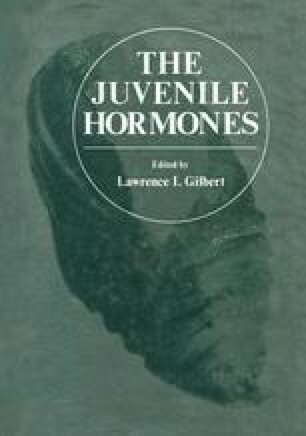 So far three naturally occurring juvenile hormones (JH) are known: JH I, JH II and JH III. From the extracts of three species of giant silkmoths, Hyalophora cecropia (Röller, 1967; Meyer, 1968), Hyalophora gloveri (Dahm, 1970) and Samia cynthia (Röller, 1972), methyl (2E, 6E)-(10R, 11S)-10,11-epoxy-7-ethyl-3,11dimethyl-2,6-tridecadienoate (JH I) and the 7-methyl-analog, methyl (2E, 6E)-(10R)-10,11-epoxy-3,7,11-trimethyl-2,6-tridecadienoate (JH II) have been isolated and identified. Judy et al. (1973) extracted methyl (2E, 6E)-(10R)-10,11-epoxy-3,7,11-trimethyl-2,6-dodecadienoate (JH III) in addition to the known JH II from the culture medium of corpora allata of the sphingid moth, Manduca sexta. The JH III has also been found in an orthopteran, Schistocerca (Judy et al., 1973; Pratt and Tobe, 1974), and by Miller et al. (1974) in Periplaneta americana by using in vitro techniques.